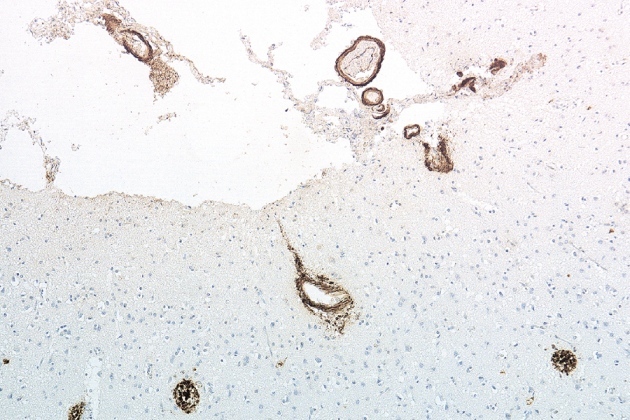 Deposits of amyloid-β protein (brown) in the frontal cortex of patients who developed CJD after surgery. The latest autopsies, described in the Swiss Medical Weekly1 on 26 January, were conducted on the brains of seven people who died of the rare, brain-wasting Creutzfeldt–Jakob disease (CJD). Decades before their deaths, the individuals had all received surgical grafts of dura mater — the membrane that covers the brain and spinal cord. These grafts had been prepared from human cadavers and were contaminated with the prion protein that causes CJD. The results follow a study published in Nature2 last September in which scientists from University College London reported that four of eight relatively young people, all of whom died of CJD decades after receiving contaminated batches of growth hormone prepared from cadavers, also displayed amyloid plaques in the blood vessels and grey matter of their brains.